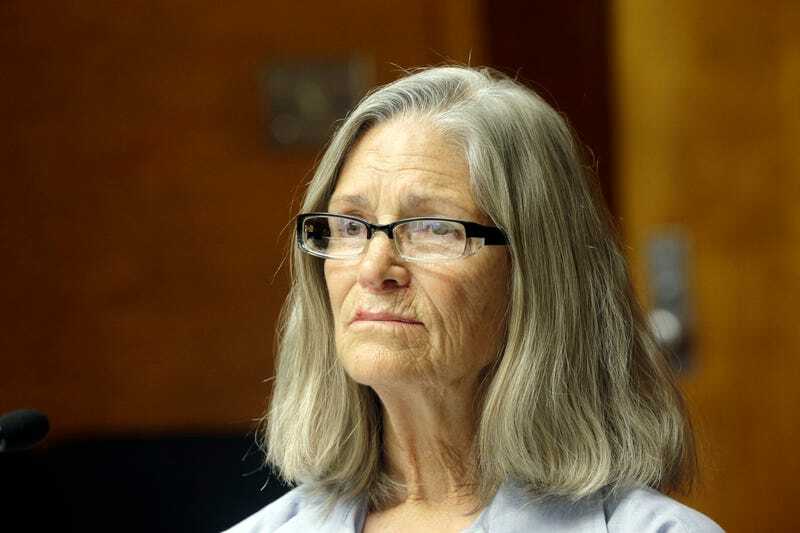 A California judge has decided to uphold Governor Jerry Brown’s reversal of the state parole board’s recommendation that infamous Manson family murderer Leslie Van Houten be granted parole. Which is a convoluted way of saying: Van Houten ain’t getting out of prison anytime soon. The decision, made by Los Angeles County Superior Court Judge William C. Ryan, was based on the existence of lingering evidence that Van Houten is still a reasonable threat to society, despite the fact that her horrific crimes were committed in 1969, when she was 19-years-old. That the grandmotherly lady pictured above not only once participated in some of the most grisly murders ever to haunt the popular imagination, but that she’s still considered off her rocker, is nothing short of mesmerizing. “There’s no question that if the word ‘Manson’ was not involved in her crimes, she would have been paroled 20 years ago,” said Richard Pfeiffer, Van Houten’s attorney, said before adding that he plans to file an appeal. Van Houten, now 67, is incarcerated at a women’s prison in Chino, California, where she is riding out the remainder of a life sentence for the murder of Leno and Rosemary LaBianca, which occurred the night after several members of the Manson clan famously murdered Sharon Tate and four others. By the time the two-day killing spree was over, seven were dead. Van Houten’s role in the couple’s deaths was vividly disturbing: After securing a pillowcase over Rosemary’s head and tying a lamp cord around her neck, she stabbed her victim 16 times in the back. (She’s since contended that the woman was already dead when she stabbed her.) Still, she was sufficiently unperturbed by the violence around her that before leaving the house, she changed into Rosemary’s clothes and drank some chocolate milk from the refrigerator. “I don’t let myself off the hook. I don’t find parts in any of this that makes me feel the slightest bit good about myself,” she’d said during her most recent hearing. At this point, Van Houten has been denied parole more than 20 times.